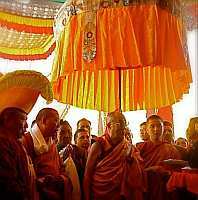 NEW DELHI, Sep 17 2009 (IPS) - The Dalai Lama’s planned visit to Arunachal Pradesh appears to be a simple, pastoral response to Buddhist flocks in that north-eastern Indian state. But then nothing has been simple between Asia’s giants ever since the Dalai Lama fled his palace in the Tibetan capital of Lhasa 50 years ago to enter India through high mountain passes leading into Arunachal Pradesh in the wake of a failed uprising against Chinese rule over Tibet. "His Holiness is visiting Arunachal Pradesh in November at the invitation of local Buddhists there. It is very simple,’’ the Dalai Lama’s aide Chhime Chhoekyapa told IPS over telephone from the north Indian town of Dharamsala, which hosts the Tibetan spiritual leader’s ‘government-in-exile’. Taking time out from a session of the Kashag, the Tibetan parliament, Chhoekyapa said the visit was no different from the Dalai Lama’s trips to numerous monasteries and centres of Lamaist Buddhism, strung out across the vast Himalayan region that falls within India. "In July, for instance, His Holiness visited Lahaul Spiti (a popular resort in Himachal Pradesh state in the Punjab region in north-west India) on the invitation of local Buddhists, and there certainly was nothing political about it," said Chhoekyapa, referring to the Dalai Lama’s sojourn that included the Kaza and Tabo towns close to the Tibetan border. Adherents of Lamaist Buddhism, which demands complete obedience to the Dalai Lama, are found in the Himalayan territories of Tibet, Nepal, Bhutan and India. Chhoekyapa said he had no comments to offer about a diplomatic row now building up between India and China over the Arunachal Pradesh trip except to say that Dharamsala did not announce or publicise the visit. Beijing has let known its displeasure at the Dalai Lama’s travel plans through a statement by its official spokeswoman, Jiang Yu, on Sep. 11, which said it revealed "the Dalai clique's anti-China and separatist essence’’. "China's stance on the so-called 'Arunachal Pradesh' is consistent. We firmly oppose Dalai visiting the so-called 'Arunachal Pradesh'," Jiang said. China refers to Arunachal Pradesh as ‘Southern Tibet’. Buddhism is practiced by 13 percent of the state’s approximately one million people with the followers of the Lamaistic version concentrated in the Tawang valley and West Kameng district in the state. Krishna was intimating that the Dalai Lama was free to visit the monastery town of Tawang, the focus of China’s claims over Arunachal Pradesh and the place where the sixth incarnation of the Dalai Lama, Tsangyang Gyatso, was said to have been born in the 17th century. The Tawang monastery is regarded as second in importance only to the Potala palace in Lhasa (formerly the chief residence of the Dalai Lama) and houses one of the last remaining repositories of pristine Lamaistic culture after the bulk of it was buried under the so-called "Cultural Revolution’’. Asked why the Indian government has chosen to allow the Dalai Lama to visit Arunachal Pradesh now when it had turned down a similar request last year, Das surmised that this may be the result of New Delhi’s annoyance over recent actions by China that it considers unfriendly. "New Delhi did everything to let the (2008 Beijing) Olympic torch pass peacefully through this country but China responded by playing spoilsport at the Nuclear Suppliers Group (NSG),’’ said Das, referring to China’s opposition to India being allowed to enter nuclear commerce in a meeting of the NSG in Vienna in September 2008. The NSG is a group of nuclear supplier countries, which include India and China, seeking to control the proliferation of nuclear materials for use as weapons. As the country which hosts some 110,000 Tibetan refugees — consisting of those who originally accompanied the Dalai Lama into exile and their descendants and those who streamed across the borders afterwards — the Olympic torch was expected to meet with stiff resistance in India when it passed through on Apr. 18, 2008. But the torch relay transpired without incident, protected by a tight security cordon thrown around a severely shortened 2.8-kilometre route in central New Delhi and by preventive detentions of Tibetan resistance leaders. Das also pointed to attempts by China earlier this year to block a 60-million U.S. dollar loan from the Asian Development Bank for a hydro-electric project coming up in Arunachal Pradesh as another possible irritant to India. The loan was approved in June over Beijing’s objections. In 2005, China and India chalked out guiding principles to convert the Line of Actual Control (LAC), the effective border between the two countries, into a de facto international border. But since then a final boundary settlement has evaded them with reports in the Indian media suggesting frequent incursions by the Chinese army, officially the People’s Liberation Army (PLA), into hotspots like Arunachal Pradesh and the Ladakh region of Kashmir. She said border incursions by the PLA, reported at various points along the 3,500-km LAC, were a sure indication of strained relations between the two countries, noting that a similar situation obtained in 1962 when territorial claims by China preceded a brief but bloody border war. More than 3,000 Indian soldiers, alongside an estimated 1,000 Chinese troops, died in that war with the PLA briefly occupying Tawang and then retreating over the mountains, mainly because it had overstretched its logistics and was still busy pacifying Tibet. But the war left China in occupation of 38,000 sq km of territory in Aksai Chin in Ladakh, which it continues to hold. China has, since the 1962 war, vastly improved infrastructure along the border by building a network of roads and railways, reaching right up to the LAC. India, though not as resource-endowed, has been trying to catch up, especially after the recent incursions. In June, J. J. Singh, governor of Arunachal Pradesh and former commander of the Indian army, told the local press that the Indian military planned to beef up its strength in Arunachal Pradesh by deploying an additional 50,000 troops and moving advanced fighter jets into the area. Singh’s statement had the effect of triggering belligerent responses in China’s state-controlled media. An editorial in the Beijing-based ‘Global Times’ newspaper on Jun. 12, reproduced in the influential ‘People’s Daily’ on the same day, warned that India, by reinforcing military deployment along the border, would only succeed in increasing "rivalry between the two countries". It asked the Indian government to consider "whether or not it can afford the consequences of a potential confrontation with China".